A major GDP software update took place on July 10, 2012. (See Update Highlights 7/10/12.) This update will increase direct communication with our users and keep you efficiently abreast of breaking news, such as GDP Release Notes, maintenance dates, and GDP News. Whenever an update has been posted, the News button in Course Manager will be highlighted for seven days after the new post. 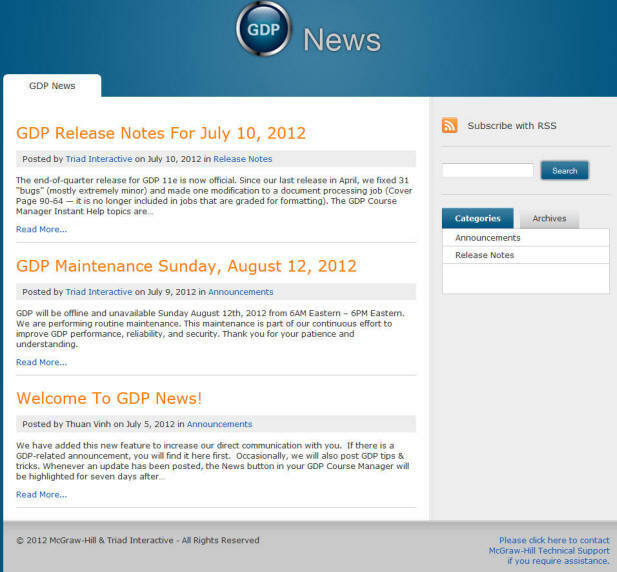 You can also sign up to receive updates via GDP's RSS feed link. 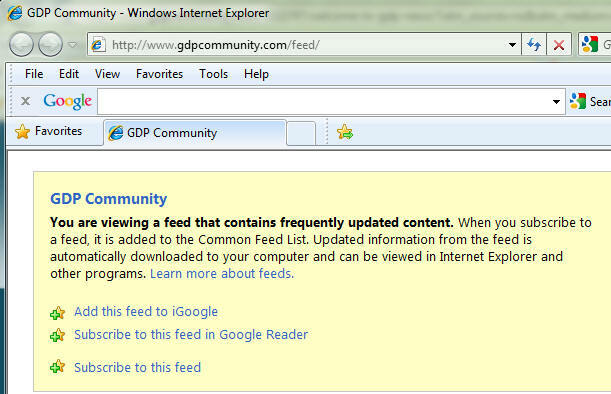 This will allow you to obtain the latest GDP news via feeds in Outlook or your favorite browser—no need to open Course Manager. Also note that on the GDP Community Homepage and on links to other individual pages, you will find a direct link to Technical Support. GDP's Course Manager Instant Help is now fully populated and complete. A major GDP software update took place on December 20, 2011. The updates listed under Update Highlights: 12/20/11 were designed ultimately to make your GDP experience more efficient and intuitive. See Course Manager Tips for more detail on the December updates. All relevant handouts have been edited to reflect these updates. When you log on to Course Manager, look for a highlighted News button and click it to access the GDP Community Homepage link, which consolidates all GDP news, or click the individual links for release notes, maintenance notes, and GDP news to display information for that topic only. Note: Whenever an update has been posted, the News button in Course Manager will be highlighted for seven days after the new post. 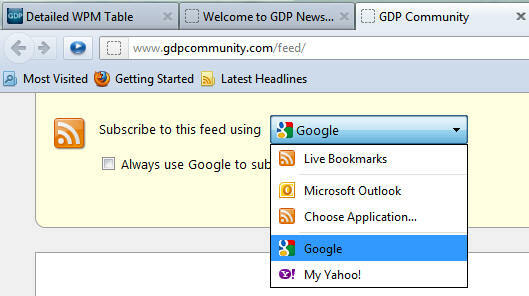 In Course Manager, click GDP Community Homepage, Subscribe with RSS. Depending upon the browser you choose, you can receive the feed via multiple sources. However, understand that regardless of your choice, you would be getting the same information using any of those subscriptions. Use the Search box for a text search of the posts in GDP Community Homepage (or the posts on the active tab) excluding the contents in any related attachments. The GDP Course Manager Instant Help topics are now fully populated and available from the Help icon in the upper right corner of the GDP window. Use this feature to send internal messages between instructors and students. See Message Center for details. When you next log on to Course Manager, GDP opens automatically to the last screen you were working in when you exited. Access new Category and Exercise type columns when you export the Portfolio as an Excel file. Access the Portfolio quickly (a) via a new Portfolio icon on the Student tab or (b) via GPS, Reports tab, where the Report Type now defaults to Portfolio. Access a different student Portfolio directly from the Reports tab using the Class, Section, and Student boxes and the Previous and Next buttons under the Student box. Access the Filter Student Portfolio window via the Filter (On/Off) button. In the Filter Student Portfolio window, filter by TW Duration (1', 2', 3', and/or 5'); check and clear the Select All box to set Exercise Category selections more efficiently. In the Portfolio Report, toggle the Show All/Apply Previous Filter button to remove and apply any previously set Advanced filters. Expanded items in the Portfolio now hold. The most recent work appears by default at the top of any expanded Portfolio listing. Expand the five items in the Portfolio in one click with the Expand 5 button. Collapse expanded Portfolio items in one click with the Collapse All button. Two movies (INSTRUCTOR: Annotations and INSTRUCTOR: Comments Library) were replaced with this movie. Many of the new features are demonstrated. Include multiple General Comments and Annotations by dragging and dropping them from the Library into the text box found in the Edit General Comment and Insert Annotation windows. In the Edit General Comment and Insert Annotation windows, type a letter or two into the “contains” Filter list box to move down your library listings automatically until the desired comment is in view. Note the expanded viewing area under Keystroking Errors in the Portfolio Details screen. The viewing area was expanded from 4 lines to 8 lines of display. Click Details on an expanded Portfolio item, then click Print; follow the steps at the bottom of the screen to Save a report that includes that screen, including comments, to an HTML file. That report includes the student name, Class/Section name, job name, attempt number, Last Modified date, Time Spent, Errors, any A.D.D.S. warning, and any instructor comments. INSTRUCTOR: Comments Library, General Comments, & Annotations, includes a demonstration of all these features and more. When you edit student data (typically, this is done at the end of a term but can be done anytime), you have the option to archive all Portfolio data for that student, but retain the student’s personal information so that student begins anew with a fresh, blank Portfolio. You can either leave the student in the assigned class or reassign that student to a new Class and Section. There is no need to request a new Registration Code. Access this feature via the Students tab; from the Actions menu for the desired student, click Edit; from the Assign Class tab, check Auto archive old student data. Note that checking this box will automatically archive all the student's previous data (everything associated with the student including resources, messages, portfolio, grades, is also archived); but the student's personal information remains intact. This cannot be undone without contacting support. Click OK, Save. If you Auto Archive a student's data by mistake, contact the CXG Digital Technical Support to have it restored. Once it is restored, the student Portfolio data and other associated data will reappear, and the student can log in as usual. All archived student data can be viewed via Students, Archive tab, Archive tab, Historical tab. Once a student's Portfolio data and other relation information are archived, the student cannot log into that account. In Instructor Management, the results for the newly data archived account will no longer appear in the Student tab or in GPS—Gradebook tab, or related reports. However, an instructor can still view the Student Portfolio and required exercise list for a data-archived student via Students, Archive tab, Historical tab. The username and student ID are appended with "-data archive-vX" and the student account is updated to an inactive state. A new student account is automatically created with the same personal information (Username, Student ID, password, first name, last name, registration code, and role) as the original. Note that because this is a new account, the Portfolio, Message Center, and so forth are blank. If you wish to edit any student data or reassign the student, so this: Under USERS, click Students; from the Student tab, click the Actions tab for the desired student and click Edit; from the Student Details tab, click Edit; edit the information in the Student ID box and the Username box; change the password if desired; click Save; from the Assign Class tab, select the desired Class and Section and click Save. You can now archive a Class, Section, and assigned students in one action. A new Archive students with class(es) checkbox can be found via Classes, Archive tab. You can now unarchive students and classes and sections in one action. A new Unarchive students with class(es) checkbox can be found via Classes, Archive tab. Use the Formatting Alerts that appear under Scoring Results as an aid to identifying possible formatting errors, but never as a substitute for an instructor’s analysis. Formatting Alerts are not always literal. Thus, the Format Scoring feature was rebranded as “Formatting Assistant” to emphasize that an instructor’s visual analysis of a student’s document is the only reliable method for assessing formatting. See GDP Instant Help, December 2011 Updates and Formatting Assistant Changes, “GDP Formatting Assistant,” for detailed information on the Formatting Assistant feature and the types of formatting errors that are analyzed. Access the REL directly via the Students tab, Column A, by clicking a Required Exercise List icon. The REL is available only if you have enabled the Interim Gradebook. This feature has changed significantly and is much more streamlined and intuitive. However, information is sensitive. Therefore, see Academic Dishonesty for more details on A.D.D.S. GDP Total Time is reported on the Reports tab at the bottom of the Student Portfolio for each student. In this example, 19.17:38:04 translates to 19 days, 17 hours, 38 minutes, and 4 seconds. Instructors will need to subtract time for any odd jobs that may have inordinately long time reported; typically in such cases, a student has worked on a document but not used Submit until hours or days later. See Time Spent and Total Time in the Portfolio [PDF] for details on GDP's time reporting. The Detailed WPM Table Report and the Detailed WPM Table Chart include new sub-filters for Timed Writings for 1', 2', 3', and/or 5'. To view Supplementary Timed Writing results by length, check both Timed Writings and Supplementary Timed Writings; then check the duration—1', 2', 3', and/or 5'. When these filters are used, the filtered results are based on the duration of the timed writing, not the exercise name. For example, if a student selects a 3' time limit on a 5-Minute Timed Writing exercise (this 3' or 5' time limit option begins in Lesson 52), the results of that timed writing will be reported when the 3' sub-filter is in effect. View helpful rollover tips for each Scheduling screen column heading. Use Filter boxes to filter by date for Start Date, Due Date, End Date, and Delay Results. Sort Scheduling IP Restrictions using the sort hyperlink. Footnote text will now be scored.